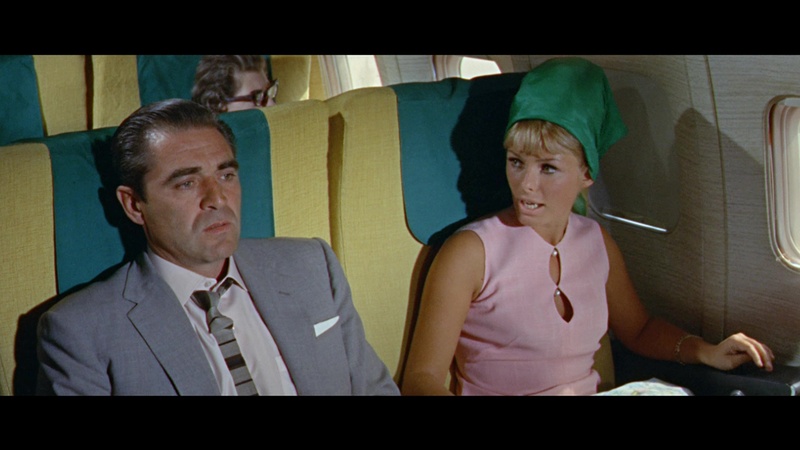 This pair of go-go era James Bond knockoffs features two ideal examples of the European craze for superspies and international detectives embroiled in espionage, bikini-clad women, and nefarious villains, with as many exotic locales as possible serving as the backdrops. Both films were produced by the infamous producer Harry Alan Towers, who could round up some wild casts in international productions (with some of the most famous in cult circles handled by Jess Franco), and helmed by British director Robert Lynn, a gun for hire who started off in TV before moving to the big screen with titles like Dr. Crippen and a Towers-produced Edgar Wallace adaptation, Coast of Skeletons. First up is Code 7... Victim 5, which casts the rugged Karl May western staple Lex Barker as an "imported private eye" named Steve Martin (presumably inspired by the Raymond Burr character from Godzilla, not the future actor and comic). 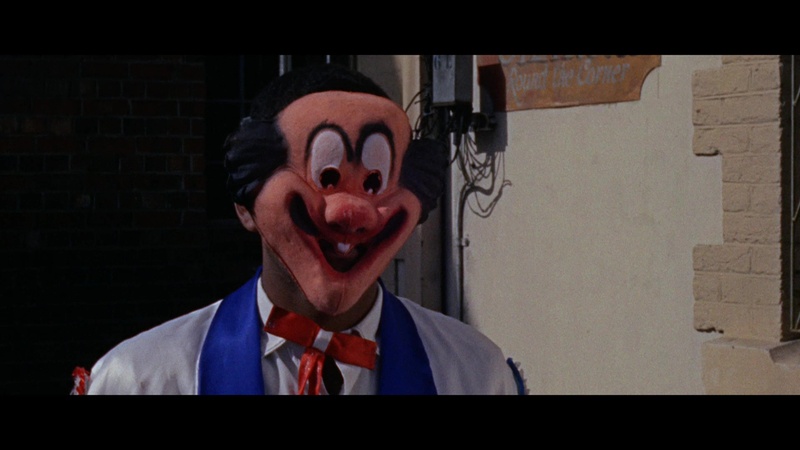 It's carnival time in Cape Town, but a dark shadow is cast over the festivities when the butler of a prominent German industrialist, Wexler (Rilla), is murdered in the pre-credits sequence. Martin is brought in to find out whether this was an isolated criminal act or the sign of something bigger and more dangerous, and of course the latter turns out to be true (or we wouldn't have much of a movie). He's escorted around by Danish sexpot Helga (Reptilicus' Smyrner) but also finds his eye tempted by Wexler's adopted daughter, Gina (Barbarella's Vendell), who has an accent so think you'll be reaching for the subtitle button. The incredibly lazy local police detective (Fraser) immediately turns over the most valuable clue, a Nazi-related photograph of five men with the dead butler's face crossed out and a younger Wexler standing at attention, which sets off an investigation filled with long drives through the South African countrysides, long underwater scuba footage, and a mounting number of dead bodies. 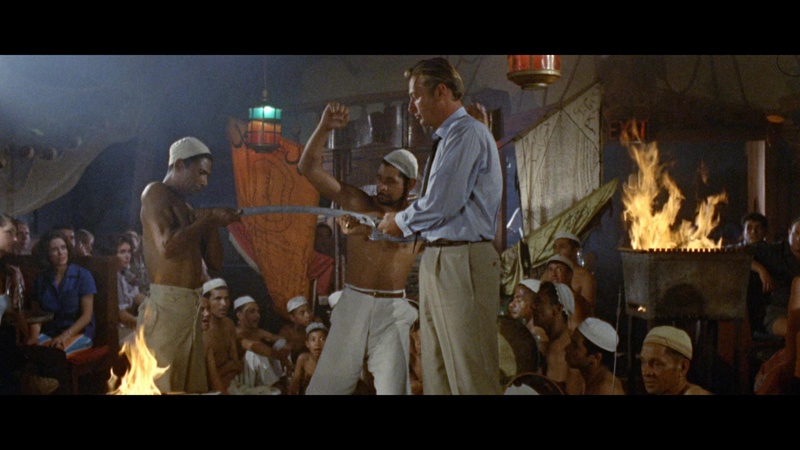 Though obviously derivative with its major plot points and story structure owing more than a nod to both Dr. No and Charade, this one is also noteworthy for its foreshadowing of the next year's Thunderball in both its underwater mayhem and carnival murder opener. Barker was quickly becoming a major European star thanks to his appearances in Winnetou and Old Shatterhand just before this, but he has far fewer opportunities to show off his charisma here as he goes through the square-jawed motions. He's perfectly fine considering the undemanding nature of the story, penned under the usual pen name of "Peter Welbeck" by producer Harry Alan Towers, but the real star here is cinematographer Nicolas Roeg, who shot The Masque of the Red Death for Roger Corman the same year and would soon hit the big time with Fahrenheit 451 and Far from the Madding Crowd in the next couple of years before becoming a major filmmaker in his own right. The bulk of the film has a bright, crisp, colorful look with the scope photography giving it a more prestigious feel than the low budget would normally indicate, though some of the second unit footage slotted in here is pretty sloppy (with extras looking at the camera a few times). Be warned that if you're averse to animal violence in films, this one definitely seems politically incorrect now thanks to the close-up trampling of a live scorpion and, most disturbingly, the use of a real dead lion (or thinking optimistically, maybe a very sedated one) at the climax of a pretty startling wildlife attack scene. 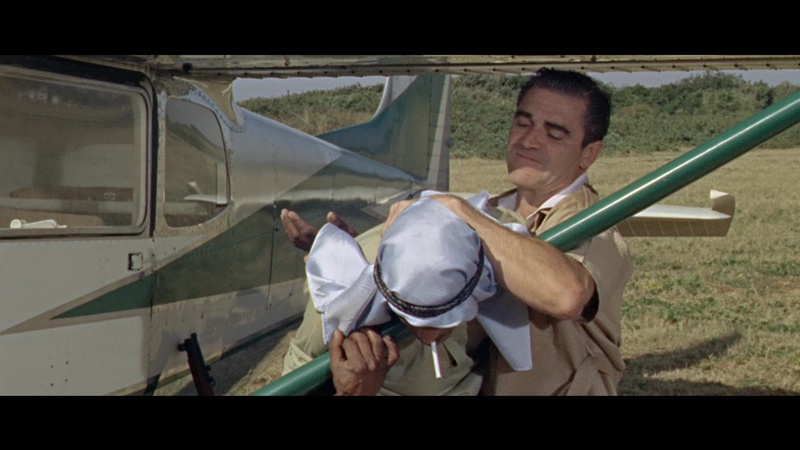 Then it's back to Africa for Mozambique, a somewhat less formulaic action film with a different leading man, American TV staple Steve Cochran, cast as a financially-strapped (and pretty ragged-looking) pilot named Brad Webster. A one way ticket to Mozambique for a gig paying a thousand dollars a month -- but involves an area where a stabbing has caused some international ripples. Brad doesn't have much of a choice since he's otherwise unemployable and potentially up for criminal charges after a downed plane (that supposedly wasn't his fault), and on the flight over he strikes up a rapport with a nightclub singer named Christina (Bach). They decide to do some sightseeing on the ride from the airport, but the trip takes an unpleasant turn when Brad finds out his new boss, Valdez, has been killed, and now he works for a shady character named Da Silva (Benson). The new boss and another questionable cohort, Henderson (Schönherr), enlist Brad in making some plane runs tied to their local pharmaceutical smuggling racket, while Valdez's widow, Ilona (Knef), turns out to have an agenda of her own since her husband didn't leave a will and "everything's up for grabs." 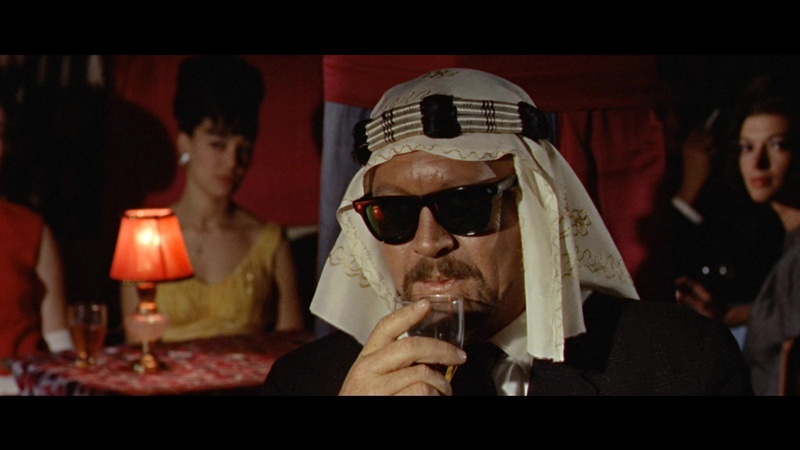 The Bond formula's less obvious here as the exotic women and locales are adapted to a more noir-inspired story featuring the screen's least convincing Arab, rampant alcohol consumption, and loads of travelogue scenery. The novelty of the setting helps carry it a long way, of course, and both of the leading ladies get torchy song numbers to pad the running time out (with Knef getting to purr hers in German). Be sure to keep an eye out in the first nightclub scene for Towers' wife, actress and Jess Franco regular Maria Rohm, wearing a very vivid shade of lipstick. The look of the film is very different from its companion, opting for shadowy interiors for much of the running time except when our hero's doing his bush pilot rounds or driving through the nearby towns. All in all it's an amusing time killer and, when seen with the first feature, makes for a solid recreation of what a '60s drive-in action double bill would feel like. No stranger to Harry Alan Towers productions, Blue Underground brings the two features onto a dual-layered Blu-ray looking considerably better than the ancient TV prints floating around. (Separate DVD releases are also available.) Neither has gotten much play in the United States since Seven Arts issued them in the '60s (the first was issued as a terrible bootleg, and the latter only came out on UK DVD just before this release), so it's nice to see them looking as vibrant and colorful as they do here. The DTS-MA HD English two-channel mono audio for both films sounds fine, with most of the support going to the scores by easy listening veteran Johnny Douglas (who flat-out quotes the James Bond theme at one point in the first film). Optional English subtitles are also included, and you also get theatrical trailers for both features. Reviewed on March 9, 2016.